Word that the climate of doom we were promised (repeatedly) has not obtained has begun leaking out. Climatologists have known this for quite some time, but now even environmental activists are beginning to realize the horrible truth that their worst fears have not been realized. The excuses have thus begun. We have already learned “Don’t say ‘Hiatus'” because that is to speak nonsensically. Saying there is a “pause” or “hiatus” assumes the models which predicted the doom which did not happen were somehow right after all, and that it is Reality itself that is error. It cannot be in the models we currently possess, because these models did not foresee what actually happened. The incontrovertible evidence is that these models are wrong. That they should not, in their current state, be trusted. That whatever they say is subject to extreme reasonable rational doubt. That decisions should not be made based upon their predictions (except the decision to produce better models). To say there is a “pause” is to say that the models were right after all, even though Reality differed from the models. To say there is a “hiatus” is to say Theory is better than Reality. This is to commit the Deadly Sin of Reification. One of the excuses is that the models were right after all, but the missing high temperature they predicted is actually in hiding. Sort of like in those movies where the Leader sneaks out of his palace or house and mixes with the ordinary people, and thus he learns What’s Really Important. That is, Global Warming has realized that people are important, too, and has given up its nefarious plans. Or something. Anyway, the “in hiding” excuse can’t be right, not exactly, because the models already swore they took into account all the sources of heat, including the oceans. Obviously the models were wrong and they didn’t take some thing or things into account. What’s wrong, though, is anybody’s guess. Because some thing or things are wrong, however, it does not mean the thing you guess was wrong was the thing that was wrong. To prove it, you’ll have to redo the models and reforecast the future. Then we wait and see. In the meantime, keep quiet. One thing we know with certainty is that the thing (in error) cannot be natural variability. Natural variability, sisters and brothers, is what the models said they could predict skillfully. The models did not skillfully predict natural variability. Natural variability just is, in this sense, what the temperature does. There is another sense of the phrase, though, a kind of enviro-religious sense that people might be using, which is, “What the temperature would do in absence of humans”. Now that is a valid thing to study. Only trouble is, it’s counterfactual. We can produce answers by the grant-load, but we’ll never know, or that is, we can never verify, whether any of them are true. Because why? Because, of course, we humans are here and have been here. There is no way to remove our influence (or the influence of any species), so there is no way to know with certainty what the climate would be like without us. Of course, we might make reasonable guesses about what a never-were-humans climate would look like. But we would know those guesses are reasonable only after we can create models that can skillfully predict what the climate will look with us. Yet, as said, we’d never be able to verify those guesses because, of course, here we are. Humans—and ants, aardvarks, and antelopes—are in integral part of the climate. All creatures influence the climate to some degree (get it? get it?). We are thus part of nature, thus part of real natural variability. It was never a question whether humans influenced climate, for the answer was always yes; instead, the real science lay in understanding how we effect it. And how everything else effects it. And we’ll know we’ve done a good job with those questions—with understanding “natural variability”, that is—one we can produce good forecasts. While what you write is true, I don’t see it affecting many global warming advocates. WE did this and WE are to blame. The reality that we are part of the system is irrelevent and probably has been since we split the atom and elevated ourselves to Godhood. It’s not about science, it’s about belief and as we both know, beliefs die hard. I did use “natural variability” here, but I DID enquote it. Wonder what the governments should do now? I dunno, “natural variability” has a nice ring to it. Try Skeptics New Le Pause Coolers with no Hidden Heat!! Made from all natural variability with no MANN-MADE ingredients AND it’s sugar-free*! *studies have shown it can be a bitter pill for some to swallow however symptoms can often be alleviated by simple hand-waving. Yeah! After all, dinosaurs make up all of Big Oil. When I ask the exact same question as this article “What would the climate be like without us”, I usually get fed that graph or the few others that are very similar. And when I ask what data was used to come up with the “natural” signal, I either get a blank stare or that they simply subtracted the anthropogenic signal from the actual data. It is, yes. The graph is purely counterfactual. End, as they said in Tron, of line. 1 – there is no pause, nor any hiatus. Take any local newspaper from the first two thirds of the 20th century and compare the temperatures given there to the current official records (any one of them) and you’ll find that the official records understate temperatures up to somewhere in the 70s. Do the same for more recent information, and you’ll find the official records overstate them to about 1998/9. The pause now appears in the data because people like Watts et al started to check on the official data and that made it much harder to continue making the adjustments the alarmism was based on. 2 – nearly 10 years ago now I had access to one of the major models at a supercomputing center. In principle the model wasn’t wrong, but in practice it consisted of a few hundred lines of fortran IV (for watfor) from the mid sixties and tens of thousands of additions. Most of the additions were either about running on different hardware/software, hard wired corrections designed to make retrocasting come out closer to the “real” data, or very simple formulae feeding output formatters for stuff that wasn’t considered germane in the 60s. 3 – given that the data has been extensively cooked and that the forecasts generally presume about an order of magnitude greater precision than can be found in the data, it is unfair to call the models wrong. Stupidly applied and modified, yes; wrong? unknown. This is nonsense! No model, either theoretical or statistical, has ever claimed to predict all “natural variability” of climate. The most that any have claimed is to identify expected or apparent patterns of some base-line around which the “natural variability” of unconsidered or unknown factors results in fluctuations of the actual data which are hard to distinguish from what would have happened if those deviations were purely random. 1) Whole AGW theory is based on (scientifically proven wrong) theory that in Earth atmosphere CO2 concentrations and greenhouse effect by CO2 can be a dominant temperature regulating factor. Seen over all 400000 years, T and CO2 seem to coincide. But, find such data where you can zoom in… Papers were published, peer reviewed and not challenged with the explicit result: in last 400000 years, CO2 concentration NEVER led the warming. Never was the cause. On average it lags 750 years and FOLLOWS temperature rise or fall. Always consequence, never the cause. b) Why (a) and what is dominant factor? Famous CERN “Cloud Experiment” of 2011. Or should I say “infamous” – because of official ban by CERN directors on interpretation of that data (the biggest shame on scientific community of all times). As one of people who knows what data sez’ – dominant factor regulating Earth temperature is interaction of water vapor in the atmosphere with high energy incoming particles (from Sun and in general). Efficiency of heating by few high energy particles is larger than for more low energy particles even if they add to the same total energy.Variation in the proportion of high energy particles incoming to Earth is the main temperature driver, couple orders of magnitude stronger than CO2 greenhouse effect. c) But what if we really overcame that proportion? If you trust NASA and MIT, we have had answer carefully studied for 8 years in 1990’s, results published, peer reviewed and not controversial… Yet, again, never used for the purpose. 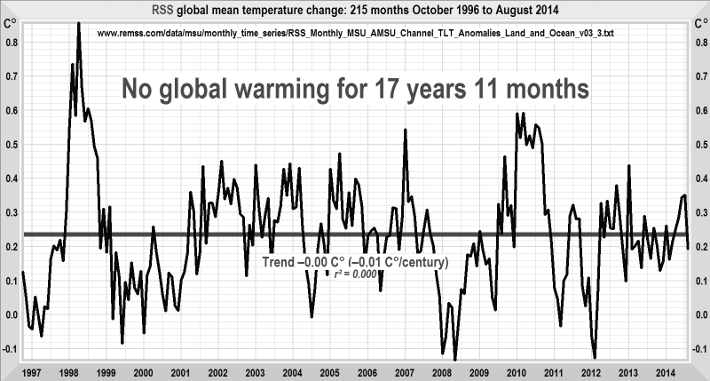 For 8 years, year after year, Earth temperature rose…. Proportion of total incoming energy to total energy sent back to space… each year DECREASED. Now read up on highschool Physics and the definition of a greenhouse effect. Definition requires that this proportion INCREASES. That study not only excluded that Earth is warming due to CO2 greenhouse effect but any other greenhouse effect, be it that we know of it being possible (ex. methane) or it is just unknown greenhouse effect mechanism at the time for us. Knowing that, does it matter that we impact climate via CO2 emissions, … no. Because points above clearly state that while we may have some impact it is as insignificant as yelling against jet engine noise. a) From what level? – Turns out that again, even in general culture we know from what, just we never connect it to this issue… We are warming from aptly named period of “Little Ice Age”. The coldest temperature period in last 10000+ years… Yes, we are warmer than our parents and grandparents,… but it would have been real catastrophe if we didn’t eventually warm up toward long term averages. Freeman Dyson’s criticism of climate models is that in some sense they are based on the counter-factual of no humans, that they focus on computational fluid dynamics because that’s easy compared to trying to model complex activities such as farming. Your comment accurately represents just about every mistake I’ve been highlighting. Let’s take it in pieces, and maybe I can convince you. Notice your use of “all”. You are saying that I claimed models should predict every deviation of temperature. Of course, I never made such an absurd claim. Instead, I said, and was very careful to say, “skillfully predict.” Now skill has a precise technical meaning, of which I am sure you are aware (or should be). For example, the IPCC’s climate models do no have persistence skill, well considered a bare minimum criterion of goodness for any meteorological model. The models therefore stink in this sense. This is true. This is what we required of the models, and it is that which they have failed to do: see skill, lack of. This one is hard to unpack because it mixes mistakes. First, there are no such things as “purely random” fluctuations of the temperature. In your favor, this is a common metaphysical error, but it is no less egregious for that. Everything the temperature does is caused. It never takes any value “randomly”; nothing does. Randomness is not a cause. What the models are trying to do is to identify all those causes of temperature which allow the models to make skillful predictions. We know, with certainty, that they have not identified these causes, and possibly that they have misidentified sources which are not causes, because there is no skill. Lastly, “natural variability” has two senses, which I demonstrated in the main post. You are failing to note which of these senses you have in mind, hence making the main error. Alan Cooper, I recommend to you the skit that is the perfect analog of AGW adherence, Monty Python’s dead parrot.. guess what the dead parrot represents and guess who the pet salesman represents. All sorts of reasons brought forth to demonstrate the parrot isn’t dead, with dilatory tactics–what nice blue plumage!!! But the parrot is dead, and so is AGW. Climate modeling is an incredibly crude exercise, based on a series of statistically unsound, and counterfactual assumptions. The IPCC models are not used individually but in ensembles, and the mean of the model runs is taken to represent reality. Natural variation is treated as random noise, and it ‘cancels out’ in the ensemble mean. As a result, the ensemble mean representing the state with no human influence is a smoothed, virtually flat line that is only slightly warmer than pre-industrial temperatures. This is taken to be the ‘natural signal’. By contrast, as an artifact of the models, the aggregate projection with anthropogenic influence runs significantly hotter than reality. The difference between the ‘natural signal’ and the ‘anthropogenic + natural signal’ is taken to be the degree that human activity is warming the planet, and is a multiple of the maximum amount of warming that CO2 alone is capable of producing. Water vapor feedback is posited as an ad-hoc explanation for this discrepancy. In summary, the anthropogenic signal is taken to be the difference between an unreasonably low and flat ‘natural signal’ and an unreasonably hot projection over this baseline which is supposed to be the result of the full heating effect that is possible from CO2 multiplied by positive feedbacks, mainly water vapor. Show me, don’t tell me. Thanks. In summary, the anthropogenic signal is taken to be the difference between an unreasonably low and flat â€˜natural signalâ€™ and an unreasonably hot projection over this baseline which is supposed to be the result of the full heating effect that is possible from CO2 multiplied by positive feedbacks, mainly water vapor. What is the true natural signal then? How do you know this? Fred Singer has some interesting thoughts on CO2 forcing and ” variability” (non-natural?). Persistence skill is the one to beat, since it really calls for very little in the way of effort to produce. The classic, general one in weather forecasting is that tomorrow will be much the same as today. You can of course narrow that down to specific measurements, and compute accuracy scores of some kind. Those are your target to beat if you want to impress others with your particular forecasting insights. 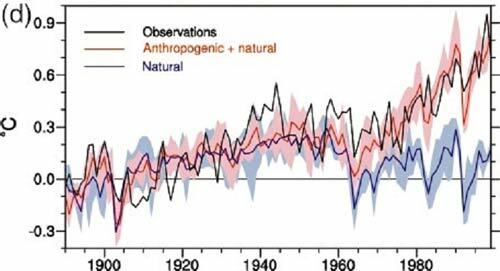 The fatuous hockey-stick contrivance was widely used, for a while , by those intent on forecasting relentless (give or take a little short-term variation) rise in global mean temperature marking our road to perdition unless we turned off more lights. The selected projections from pampered computer models of the climate system looked a bit of a mess, but their overall rising trend was clear, and of course portentous. A couple of forecasting specialists called Armstrong and Green took a look at what scraps they could find about the IPPC, and also the noted publicists of alarm, Mr Al Gore, and their forecasting penchants if not methods. They did not like what they found. These chaps had identified dozens of characteristics of successful forecasting processes, and could they find any in amongst the IPCC et al mess? Nary a one. So they reckoned they could do better. After examining this and that, working through their dozens of characteristics, they decided that they could not do better than a simple persistence forecast. So that is what they forecast: global mean temperature will stay the same. Now of course they know it will vary, but what they claim is that when you look at the forecast errors (observed – expected), their forecast should be better than the IPCC Gore one. So far, they have been proven correct in this. See their own tracking here: http://www.theclimatebet.com/. For an introduction to their rationale and a link to further details of it, see here: NIPCC report . â€œClimate is the continuation of the ocean by other meansâ€, (see: http://www.whatisclimate.com/ ), showing that they understand where the major problem is with regard to â€˜natural variabilityâ€™. Thank you Briggs for that response. In fact I was not aware of the technical definition of forecast “skill” (but am not sure I agree that such awareness is a reasonable expectation of the non-specialist audience). So, at least until I have a better grasp of it, I withdraw the remark that it was “nonsense” to say “Natural variability, sisters and brothers, is what the models said they could predict skillfully”. Some model makers may have made that explicit claim (does it always have to be relative to what Wikipedia refers to as a “reference model” and can the claim of relative “skill” over a longer time interval be refuted by reference to actual data over a shorter one?) , but it is not yet clear to me that the two types of “model” I referred to necessarily make any false claim of skill. With regard to your criticism of my use of the phrase “what would have happened if those deviations were purely random”, I still claim innocence. If you re-read what I wrote you will see that I did not there assert that any phenomenon actually was or is random, but just referred to the claim that the actual data would not by themselves cause one to disbelieve that they were random (in the same sense that a coin toss sequence HHHHHHHHH, while no less likely to come from fair coin than HTTTHHTTH, would nonetheless be more likely to cause most people to suspect that the coin was not fair). Getting back to the use of the phrase “natural variability” I do agree that it is unfortunate because of its various interpretations, and I think that the sense in which I defined it (as the difference between model predictions and actual data) is actually different from both of those that you identified. Show me, donâ€™t tell me. Can’t tell you whether YOU should say “natural variability” or not, but I do know statistical models are postulated in attempt to model the observed variation. Pingback: alQpr » Blog Archive » What is â€œNatural Variabilityâ€? With regard to your criticism of my use of the phrase â€œwhat would have happened if those deviations were purely randomâ€, I still claim innocence. No, you’re guilty just for using the word for that’s one of the the ground rules of this ballpark. In the context of climate (and field other than quantum mechanics), I think Briggs makes a defensible argument on this point. I can accept as axiomatic that everything that happens in weather and climate is the result of a chain of causality. The chaotic physical processes of such a large and complex system are such that they appear random even though they are not. That’s as far as I agree with Briggs and others here in this specific application. When observed “random deviations” from a mean trend can be described by a probability distribution, it follows that they can be modeled stochastically, especially in circumstances where we care more about the frequency and range of those deviations rather than the exact timing of the peaks and valleys  — and where predicting the exact timing from initial conditions is all but currently impossible. That sort of nuance falls on deaf ears in this venue, and even a whiff of an implication that the underlying phenomena are “random” only adds more fuel to the “models are bogus” narrative. His exact words in the original article were: Natural variability, sisters and brothers, is what the models said they could predict skillfully. The models did not skillfully predict natural variability. Natural variability just is, in this sense, what the temperature does. He wasn’t at all careful to provide any citations for the purported intent or capabilities of “(all) the models”. He made no attempt demonstrate by quantification the lack of skill in “(all) the models”. He repeats “they have no skill” for reinforcement, and ignores calls for a demonstration. Is not “what the temperature does” in this sense what you and I really mean when we say “random”? The cousins of “natural variation” are “unforced variation” or “internal variability”. In literature, the usage of such terms does not mean “without cause”. But why speculate and assert when we can get the skinny straight from the horse’s mouth? An examination of a 300-yr simulation of the atmospheric and oceanic interactive ensemble (iv) indicates that despite the noise reduction at the air-sea interface, the model produced irregular ENSO events with realistic amplitude, but with frequency that is too high. This suggests that the model ENSO is self-sustained as opposed to damped. An analysis of variance indicates that internal ocean dynamics makes a substantial contribution to the SSTA variability in the eastern Pacific and the coupled air-sea feedbacks enhance this variability. Conversely, air-sea feedbacks work to damp SSTA variability due to internal dynamics in much of the Southern Ocean and the North Atlantic. … I do know statistical models are postulated in attempt to model the observed variation. A climatologist that I’ve discussed this with claims that the models do predict climate pauses, just not *this* climate pause. This is an extension of the argument that while weather models fail due to chaos, climate models do not because, even though the prediction for any point in time fails to verify, the ensemble of those predictions from one model (over time) is statistically correct, and even moreso if the ensemble contains multiple runs (say, with initialization dithering like weather modeling uses). I’m just reporting, not advocating.